ISPO Beijing 2012, the biggest outdoor sports show in Asia, was held at the China National Convention Center, in Beijing, China. More than 24,500 industry professionals came to look for what’s stunning and what to purchase among the 516 brands exhibited by 353 exhibitors. 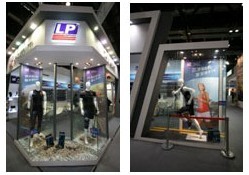 LP, the pioneer in sports protection field, displayed its professional and comprehensive sports protection products via prominent booth design to create an outdoor atmosphere with window displays showcasing outdoor sports. Based on sports biomechanics and sports physiology, LP created the Compression Garment Series. With three precisely designed knitting structures, LP Compression Garment Series provides appropriate compression for various body parts to help increase blood circulation, reduce energy wasting, and elevate sports endurance. Moreover, the unique 3D weave air flow and mesh zone provide sports enthusiasts the optimal comfort experience from the quick-dry and breathable effect. LP Compression Garment Series is indispensible for outdoor sports enthusiasts who exercise for an extended period of time. With the help of a cutting-edge technology, 3-Dimension knitting mode combined with 3-Density knitting levels, the X-TREMUS Series fully fits body curve, provides appropriate support and also enhances athlete performance and joint stability. High-end design, high quality workmanship, and superior comfort not only caught visitors’ eye but also generated a lot of interest. LP built a compression map through Power Sleeve with various and ideal compression level to help decrease the muscle movement and energy wasting by reducing the affect of internal perturbation. Thus, LP Power Sleeve empowers outdoor sports enthusiasts to walk farther, run longer and hike higher. From head to toe, from basic health care to advance sports protection, from pre-training to post-training, LP provides total solution via professional and comprehensive product solution which includes Orthopedics, Insoles & Footcare Products, and Accessories to meet every outdoor sports enthusiast’s needs. LP has impressed visitors for its booth design, brand-new products and comprehensive sports protection; it has successfully built a strong connection between sports protection and outdoor sports. The brand image is strong, and reputable, LP will keep innovating to provide all sports enthusiasts the professional and comfortable protection and sharing the fruit of success with our partners around the world.